Every year, Switzerland develops music fever: the Montreux Jazz Festival is one of the most popular and most renowned musical events in Europe. And once again this year, numerous visitors were delighted by the multi-faceted programme and strong voices. National and international acts performed during the two weeks of the Festival, and this year the SWISS Band itself really got the audience on its feet. 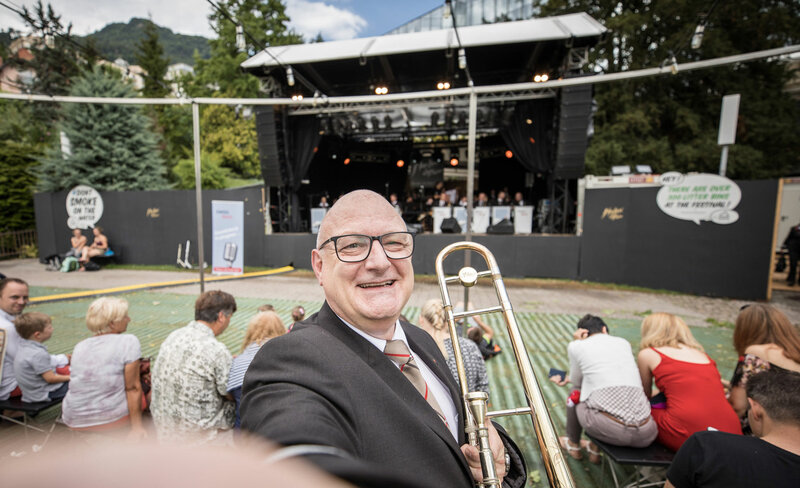 André Ruth has been a member of the band for 36 years, and here he tells us about his day and his performance at the Montreux Jazz Festival. With 22 musicians from the technical department of the former airline Swissair, the era of the SWISS Band began on 22 August 1958. Today there are over 50 members in the group – many active, retired and former members of SWISS. Including Captain André Ruth – and currently also Chairman of the Band – who joined them 36 years ago with his tenor horn. "And then the trombone came along in 1990." The SWISS Band has also performed abroad, including at the opening of a Swissôtel in Chicago. And yet André describes its appearance at the Montreux Jazz Festival as one of the milestones in the band's career: "It is one of the most renowned musical events in the whole of Switzerland – of Europe even! And we were able to take part. That's just amazingly fabulous!" The day gets off to an easy start for the band. They depart from Zurich, Kloten at 11.45 am, travelling by coach towards Montreux. "There's a great atmosphere on the bus, and everyone is looking forward to the performance!" Lunch is eaten on the bus, because there's a tight schedule ahead of them when they arrive. Including the soundcheck, of course, and a quick rehearsal. Around 40 members of the SWISS Band will be performing at the gig at this year's Montreux Jazz Festival. That's a lot of musicians – and they're an extremely well-established team: "We usually practise once a week for two hours in Kloten. Every section practises for two hours once a month. Then there are the SWISS Band rehearsal weekends, such as the one in the Black Forest in October." However, rehearsals are stepped up before performances, and last for three hours. The instruments are waiting for the band when they get there. The logisticians set off for Montreux early in the morning, arriving before the SWISS Band. And now everyone pitches in! Including the musicians: "We help the logisticians with setting up the instruments backstage." Then it's time for a break, and everyone can rest after the journey on the SWISS Terrace on the site of the Montreux Jazz Festival. "The lakeside location is a dream! Unfortunately, though, I was unable to try out the SWISS loungers because there was a huge thunderstorm. We had to shelter from it in the Lounge ..." Thankfully, the rain stopped just in time for the band's performance: "And we even saw the sun!" Things gradually start to get serious, and it's time for the soundcheck. We allow about an hour for that. "It's one of the most important tasks before every concert!" It can start as soon as the musicians are all in their seats with their instruments in hands and their music in front of them. "The various sections play a few notes so the microphones can be positioned correctly. An impossible task without the sound technician!" And so it continues, until all 40 of the musicians' instruments have been checked. Today's special guest, the singer Flavia Capello, who is performing with the band, also has to check her microphone. A few notes of some of the songs are then played to make sure the overall sound is right. My fingers start to tingle. "I love my music. To me, it's not just a great way to relax from work, but it's also a way of meeting lots of people. A single instrument by itself is never as effective as a whole group of them!" Now it's time for a few deep breaths, and to prepare mentally for the big performance. It's time: for our 90-minute performance at the Montreux Jazz Festival. The instruments and musicians are ready. My uniform is neat and tidy. It's a real one, by the way, although it has only two silver stripes on the sleeve, unlike the pilot's uniform. The SWISS Band plays various classics, although it's quite clear what André's favourite is: "I personally love 'Welcome To The Jungle' by Guns’N’Roses, along with all the general 80s rock numbers!" And there they are, delighting visitors to the Montreux Jazz Festival – a performance that the SWISS Band has been looking forward to for a long time. "Standing here on the stage is just the most amazing feeling! Especially when you realise how much the audience is enjoying our music and dancing along." The mood is unbelievable, and the audience wants more. "Encore!" the cry goes up, and the SWISS Band is only too happy to oblige with another two numbers. And what a success is has been! The band and the audience are delighted. Unfortunately, there's not much time for celebrating our successful performance. Because some of the band members are back at work on the next day, it's time to head for home. But what do music and flying have in common? "Of course, you'd be forgiven for thinking there was nothing. Music tends to be emotional, whereas working in the cockpit is technical. Both demand a tremendous amount of experience, and excellent preparation. Working in a team is also extremely important in both activities." Tired but happy, the SWISS Band finally sets off for home.